Burgess Hill Town chairman Kevin Newell says it will take 'a very special applicant' to replace interim joint managers Simon Wormull and John Rattle - and he doesn't want a 'Mourinho' coming in demanding money. The Hillians have been on the look out for a new manager since Ian Chapman parted ways with the club on October 19. And since that news, Newell has received 10 'serious applications' without formally advertising the position. There will be an application form appearing on the club's website from tomorrow Wednesday). Newell said: "I have got about 10 serious applications to consider. People around the football club knew some of these people so we were able to talk about what we knew about them and what they could offer." The closing date for applications will be next Wednesday (November 7) and Newell hopes to appoint by next Friday. But Newell said it will take someone special to oust the current interim bosses. He said: "The view is that anybody who is applying for the job has got to be a very special applicant if we are going to see them being an improvement on the interim managers who I have got at the moment who have done extremely well. "Simon and John are doing what I call a hands-on interview in a very persuasive way. That’s not to say we are not looking at anybody else but I do expect that those applications have got to be something special." The chairman also needs applicants to know they can't come in demanding money. He said: "The other thing I have to find out from other people are whether they are able to work within the constraints of the relatively small Premier Division budget that I allow to the managers. "I don’t want to get into a situation where I have a Mourinho coming in saying ‘I can keep you up as long as I have this much money’, because my budget is very strictly controlled. I am not in the business of throwing money at it." Newell would not be drawn on who the current 10 applicants are but said: "There are some well qualified and experienced people who have applied but I have to look at those in the context of what the current managers are doing and consider whether they are going to be an improvement on that or not. "They will know they have got to impress me greatly." Chapman left the Hillians after six and a half years in charge of the club. 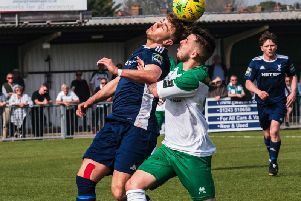 His last game for the club was the 8-0 defeat to Burgess Hill Town, when he took a short leave of absence before finally parting ways a fortnight ago.